This post is a tad bit late this week. Why? Well I was suffering from post holiday blues! I mean it was all sun, sand, sea, glorious food and sangria for a whole week…I came back and what did I get? Crappy weather and shed loads of work, happily waiting for me!!! 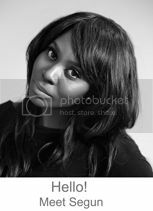 And I swear the work had a smug look as if to say…hah!! You thought you could get a way didn’t you – well I showed you!! Cue evil laugh…ha, ha, ha…I mean is it too much for a girl to want to keep that holiday feeling going? As they say there is no rest for the good, is there? Anyhu I have now been cheered up by a box of goodies from the folks at John Frieda with a number of lovely looking products which are meant to be good for my hair – so will keep you posted on them once I have tried them out…seriously there is nothing like pressies and beauty stuff to get me smiling again. Now on the subject of beauty stuff – I have to say my all time favourite product from my holiday trip was my new sun protection. 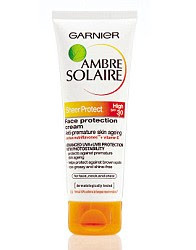 A friend suggested Garnier's Ambre Solaire Sheer Protect 30 for my face….and I loved it! For a long time now I have been searching for a face sun protector that wouldn’t leave me with that horrible white filmy mask due to its zinc contents and I found it with this. It was light, non greasy and absorbed easily. Now for brown girls who don’t already know this – although being darker does provide you with a little bit of protection it doesn’t fully protect you from the sun’s harmful rays. You do need sunscreen to prevent premature skin ageing and if you have any scarring that you are trying to fade away – it’s essential that you wear sunscreen otherwise the suns rays can remove all your good work and actually encourage your marks to get darker!! !